The Max Energy E-CON Economy Power Programmer is designed for the driver who needs better fuel mileage and more power, but doesn't want to pay for other high-performance features they may not need. Every E-CON is programmed with Hypertech's Max Energy Tuning, the best optimized fuel tuning programs possible that increase horsepower and torque. Max Energy Tuning extracts every bit of energy possible out of every molecule of fuel giving you more miles at part-throttle and and more power at wide-open throttle. In order to increase engine efficiency, horsepower and torque, our engineers optimize the spark and fuel curves point by point over the entire rpm band. With the additional power and optimized transmission functions, drivers use less fuel to accelerate and maintain cruising speeds without the torque converter un-locking and transmission down-shifting to a lower gear. The results are improved power and maximum fuel mileage. Hypertech's customers are claiming 2 to 6 mpg gains and a substantial increase in horsepower and torque. 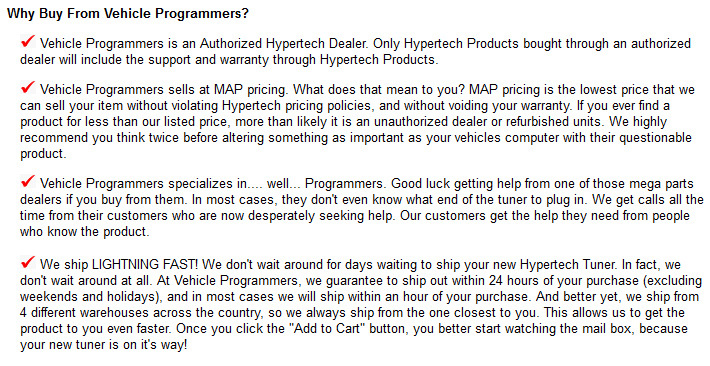 Note; Vehicle Programmers is an authorized Hypertech Dealer, so your purchase will include the full factory warranty. Engine Tuning: The Max Energy E-CON offers "Regular Octane" tuning for both gas and E-85/Flex-Fuel vehicles. This program will deliver excellent power gains for cars or trucks that come factory capable of using more economical regular octane. The Max Energy E-CON is NOT recommended for vehicles using premium octane. Diagnostics: If you get a "check engine" light or "service needed" message, the Max Energy will allow you to read the code and gives you the ability to clear the code and turn the "check engine" light off. You can then make the necessary repairs to prevent the light from coming back on. Internet Updateable: The E-CON comes with a USB cable and a CD containing software to enable quick updates or upgrades over the internet. This allows you to make sure your Hypertech Max Energy E-CON is always up to date, and loaded with the most recent calibrations. Return to Stock: Hypertech's E-CON downloads and saves your stock tuning program, then uploads your customized Power Tuning program. Before taking your vehicle into a dealership for service, always return the vehicle's computer back to the factory programming. 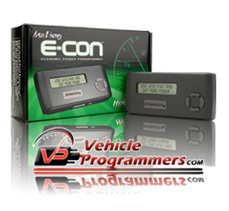 Once you have the vehicle back from the dealership, reinstall the E-CON Power Programming.